To keep up-to-date with the progress of the EMPoWER project, please see the new EMPoWER Blog. EMPoWER is an NIHR HTA funded evidence synthesis project examining the cost-effectiveness of earlier provision of powered wheelchair interventions for children with mobility limitations. The project is being led by Bangor University, in collaboration with Newcastle University. The aim of the EMPoWER project is to estimate the costs and benefits of providing very young disabled children (under 5 years) with powered mobility aids, such as mini wheelchairs and ride-on-cars. During the conduct of this evidence synthesis project, we will combine the results of existing research and produce an economic model to predict how cost-effective it is to provide powered mobility aids from a very early age. More than 70,000 children in the UK use special equipment, such as wheelchairs, to help them move around. There are many different reasons why children may have issues with their mobility, and for some children powered or electric mobility aids (such as powered wheelchairs) may be the only way to move around on their own. Helping children under the age of 5 to move around on their own can have long-lasting benefits, including physical and mental development, increased independence and more participation in everyday life. These benefits can also have positive impacts on the physical and mental health of children’s parents, and may reduce later health, social care and education costs. What is currently unknown is whether providing powered mobility aids for very young children provides more benefits than waiting until after the child is aged 5. The NHS is the largest UK provider of powered mobility aids for children, but there is often variation in what different NHS services provide, particularly for children under the age of 5. At the moment there is no national guidance to help NHS services decide the best age to start providing powered mobility aids for children, or what costs and the benefits to consider. 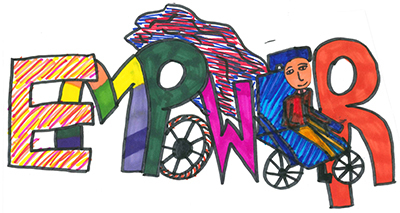 As part of the EMPoWER project, we will gather all existing research and evidence about the costs and benefits of powered mobility aids for children. We will look at the quality of the evidence and combine all relevant information to get a better understanding of the extra costs and benefits of providing powered mobility aids (and related training and support) at a very early age, rather than waiting until after a child turns 5. Using this information we will develop an economic model, which will allow us to estimate whether the extra benefits of early powered mobility outweigh the additional costs.